EMIL RIZEK | Geringer Art, Ltd.
Emil Rizek was born on May 31, 1901, the son of a Viennese electrical engineer. Although his father wanted him to also become an engineer, young Rizek took private art instruction with Anton Hlavatschek and also with Carl Fahringer, a professor from the Viennese academy. In the 1920s Rizek traveled to Italy, France, Germany and Holland where he was associated with the “School of the Hague” a group of Dutch Impressionists. Finding himself constantly poor in Vienna, Rizek decided to travel the world in a search for adventure, artistic inspiration and cheaper living. It was his personal goal to travel around the world, and record his travels in paint. Rizek essentially trained himself as he traveled, and developed a personal style based in realism. Landscapes, city views and genre scenes of everyday work and life began to appear in his work. His figurative works often portrayed laborers or workers with whom he had a sense of comaraderie. 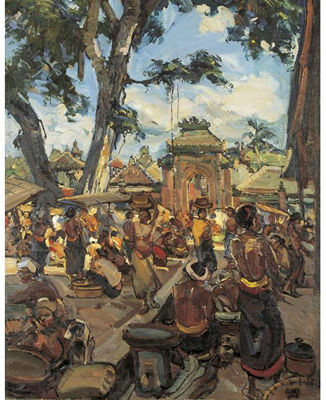 He painted the marketplace of Bali and the ports of Northern Europe with equal flair. On his first major world trip, between 1928 and 1931, Rizek traveled and painted in Indonesia. On a second trip, lasting from 1932 through 1935 he visited Canada, the United States, Japan and South Africa. In 1938 taught painting in Oakland California, and also painted and etched scenes of San Francisco’s Chinatown. Rizek served in the Wehrmacht beginning in 1941 serving as a war artist and reporter, mainly in Finland. He was captured by the British army and spent ten months as a prisoner in Ostfriesland near the end of the war. Rizek was emotionally drained by his experiences in the war, and found it extremely difficult to return to painting. As his creative energies returned Rizek again traveled, making annual visits to Ostfriesia where he created works that show a careful observation of light. In 1963 the Artist’s Guild of Vienna awarded Rizek a special gold medal in recognition of his artistic achievements. However, his career and reputation suffered with many collectors due to his Wehrmacht service. Emil Rizek died in Vienna in 1988.